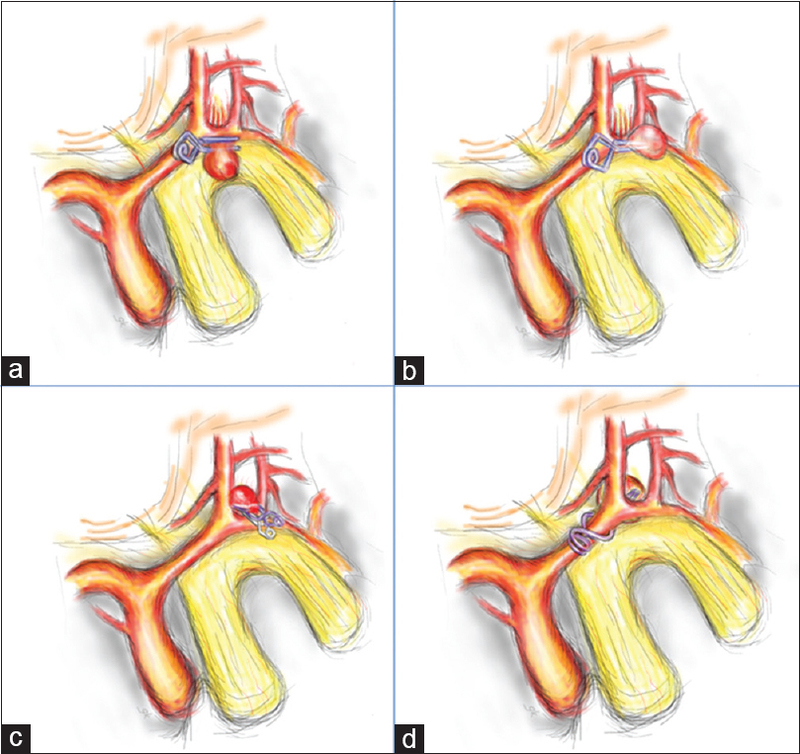 The evolution of aneurysm clips is a testament to the tenacity and ingenuity of vascular neurosurgeons, and their quest to develop a cure for a disease, once thought insurmountable. Aneurysm clips have gone through many changes, both in the materials they were made of, and in the intricate design of their mechanisms. As endovascular methods of treatment of intracranial aneurysms gain more acceptance and wider usage, knowledge of the evolution and fundamental principles of the use of aneurysm clips may become increasingly obscure to current neurosurgical trainees. This article is an attempt to inspire the budding neurosurgeon by telling the story of how this amazing piece of instrumentation evolved. We will also describe the basic principles of its use. There are four major clip designs that are currently available in the market, and these are the McFadden Vari-Angle, Sundt Slim-Line, and Sugita and Yasargil type clips. Of these, the last two are commonly available. The U/V configuration clip, when originally designed by Cushing, was malleable [Figure 1]a. Olivecrona added flanges to the clip so that it can be opened in case of improper application. An important advancement was the incorporation of a spring mechanism to allow repeated opening and reapplication. According to McFadden, the spring mechanism was developed in 1840 by the French instrument maker Joseph Charriere. He described it as one of the most significant alterations in the basic forceps design. Charriere's design modification reversed the action of the forceps-opening the blades when compressed and letting it close when released. The pivot clip resembles a clothes peg with a central pivot and an external spring mechanism to allow for opening [Figure 1]b. Examples of these include the Heifetz and Lougheed-Kerr clips. The next development in clip design was the development of clips that had no external springs but were designed to open and close based on the elastic properties of the metal and the shape of the clip itself. The first of these was the mobile fulcrum Scoville clip that had an advantage of not trapping branches or vessel wall at its fulcrum point [Figure 1]c. However, the Scoville clip had a tendency to slip off. The alpha clip is the most widespread design available today [Figure 1]d. The widely popular Yasargil and Sugita clips follow this design. It is simply a crossed shaft design that resembles the first Greek letter 'α'. Clips are also classified as standard and mini based on their size. They are available in a variety of shapes and sizes. In-vogue Sugita and Yasargil clips are available as standard, mini, and extra-long sizes. They are also in myriad shapes-straight, curved forward, backward and sideward, bent forward, backward and sideward, and bayoneted. In addition, clips may also be fenestrated. A fenestrated clip has a second loop apart from the alpha to incorporate a branch if required. Kees made a fenestrated clip overnight when Professor Drake requested him to create a special clip for an otherwise unclippable basilar bifurcation aneurysm. The ipsilateral posterior cerebral artery was preserved within the fenestration. Select clip types that merit mention are the booster clips, t-bar clips, and Sundt graft clips. A booster clip is used to augment a long clip placed across a giant aneurysm neck. Long clips have low closing force at the tip. A booster clip fits over the long clip strengthening closure across the neck and preventing its slippage. T-bar clips help in parent artery reconstruction by having a horizontal segment that is perpendicular to the direction of the clip itself. The horizontal segment occludes the neck while the parent artery is incorporated in a fenestration. Sundt clip incorporates a Dacron mesh to repair vessel wall accidentally torn during surgery. These clips, though rarely available now, can be used in blister aneurysms, or during catastrophic aneurysmal neck tears. Temporary and permanent clips are classified according to the closing force they generate. This distinction is important when one considers the need for a temporary occlusion of the parent or proximal vessel prior to securing the aneurysm. The latest Yasargil and Sugita temporary clips show a closing pressure of between 0.88-1.08N (90-110g) and 0.69N (70g), respectively. , Permanent clips have a closing pressure 1.27-1.47 N (130-150 g, Sugita) and 1.47-1.96 N (150-180 g, Yasargil). The closing pressure is the lowest at the tip and maximum at the pivot. Studies have shown that the closing pressure could be dangerously high near the pivot and could cause an aneurysm to rupture even when a temporary clip is applied. Over the past many years, aneurysm clips have evolved to become safer; more versatile; and show a rich variety of sizes, shapes, and materials. The expanded armamentarium aids the neurovascular surgeon to tackle almost any aneurysm configuration. Clipping of an aneurysm requires planning and deliberate dissection. A calm surgeon, sitting down on an operating chair, resting his elbows and hands in an ergonomic position can control tremors and increase his motor efficiency. Mouth operated control of the microscope facilitates minute changes in the angle of visualization without taking the hands off. Sharp arachnoidal dissection and gentle probing with a rounded dissector reveal the anatomy of the neck of the aneurysm, associated branches, and perforators while avoiding the dome. Risky maneuvers like freeing a vessel adherent to the fragile dome of the aneurysm or advancing a permanent clip is carried out after temporary clipping to soften the aneurysm. Incomplete closure of the tips of the blade can also occur, because the proximal parts of the blades are held open by voluminous or atheromatous aneurysmal tissue. Tandem clipping with a fenestrated clip can be done in such a situation. A fenestrated clip is placed first and then the proximal part of the neck is closed with additional straight clips. It is important to remember Rhoton's rules of aneurysm formation while understanding the fundamental principles of clip application. The rules state that (i) aneurysms arise at the branching sites on the parent artery (side branch or bifurcation), (ii) aneurysms arise at turns or curves in the outer wall of the artery where hemodynamic stress is the greatest, (iii) aneurysms point in the direction that blood would have gone if the curve at the aneurysm site was not present, and (iv) each aneurysm is associated with a set of perforating arteries that needs to be preserved. Hence, according to rule 1, clips should be applied perpendicular to the afferent artery and parallel to the efferent branches with bifurcation aneurysms, while according to rule 2 and 3, clip is applied parallel to the parent artery with aneurysms at curves (ophthalmic artery and superior hypophyseal artery (SHA) aneurysms). According to rule 4, the clip is applied parallel to the line of perforators across an aneurysm base. As far as possible, the direction of the clip should be parallel to the direction of the parent vessel and the neck. That angle prevents kinking in the parent vessel and also avoids catching perforators at the tip of the clip. There is a higher chance of rupture of the neck of the aneurysm if a clip is placed perpendicular to the parent artery. For aneurysms of the anterior communicating artery, middle cerebral artery (MCA), basilar bifurcation, ICA-ophthalmic artery, and many other aneurysms, parallel placement of clips is crucial. For ICA aneurysms pointing inferiorly, such as superior hypophyseal aneurysms, a right-angled fenestrated clip is preferable, incorporating the ICA in the fenestration. However, for some aneurysms like posterior communicating (PCOM) aneurysm, a perpendicular placement of the clip is often sufficient and safe. » Temporary Clip: A Rule or a Choice? 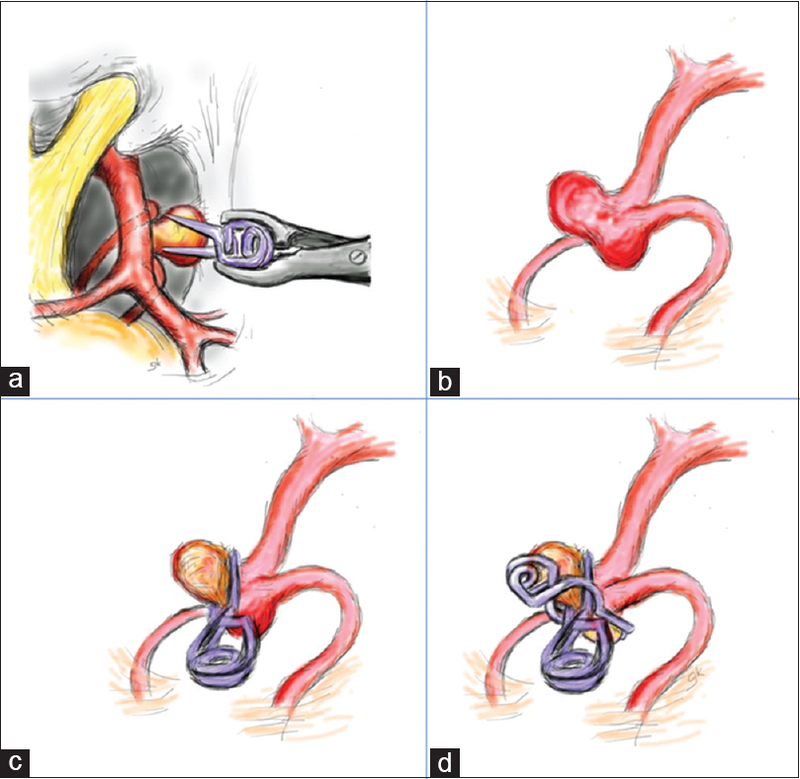 Many surgeons advocate almost routine use of temporary clips on the parent vessel, especially in ruptured aneurysms, before final dissection and placement of the permanent clip. The temporary clip softens the aneurysm and makes the neck more pliable, aiding in dissection of adherent vessels. Planned temporary clip placement reduces the risk of massive blood loss and obscuration of the operative field in the event of a rupture. A particular situation where one might consider avoiding temporary clip application is when the vessels are very atherosclerotic. However, a few surgeons avoid routine placement of temporary clips and reserve its use only when there is an intraoperative aneurysmal rupture. A suboptimally placed clip can usually be used to our advantage as a tentative clip by not hastily removing it, but by stacking another clip on top or below and then removing the first clip. Such a maneuver is especially useful when an aneurysm bleeds prematurely. A tentative clip can be used as a means of temporary flow control when proximal control is not established. Most PCOM aneurysms are clipped using a simple straight clip. The PCOM artery usually arises proximal to the neck of the aneurysm [Figure 2]a. A more ventrally pointing aneurysm may require a right-angled fenestrated clip. 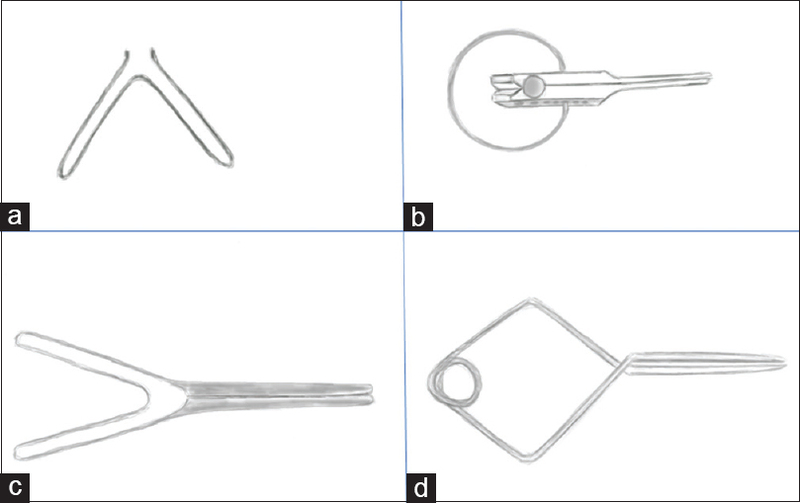 MCA aneurysms are clipped in many ways: Simple clipping, multiple clipping, fenestrated clipping and vessel reconstruction [Figure 2]b, c and d. It is important to place the blades of the clip parallel to the branches. In a broad-based aneurysm, this may require a curved clip, matching the curve of the bifurcation. A small residual neck can be clipped by an additional small mini-clip. Inferiorly projecting aneurysms can be clipped easily by a simple straight clip, taking care, not to take the contralateral A1 at the distal end of the clip [Figure 3]a-d. Similarly, anteriorly projecting aneurysm is tackled with a simple straight or curved clip. While clipping superiorly projecting aneurysms, the ipsilateral A2 may come in the way of the neck. One option is to manipulate a straight clip anterior or posterior to the A2 closing it parallel to the communicating segment. If that is not possible, a straight fenestrated clip may be appropriate, saving the ipsilateral A2 in the fenestration. Posterior pointing aneurysms are the most challenging, and typically require an angled fenestrated clip, encircling the ipsilateral A1, A2, and/or ACOM complex itself. These aneurysms are clipped after drilling the anterior clinoid process and cutting the distal dural ring to completely visualize the neck. 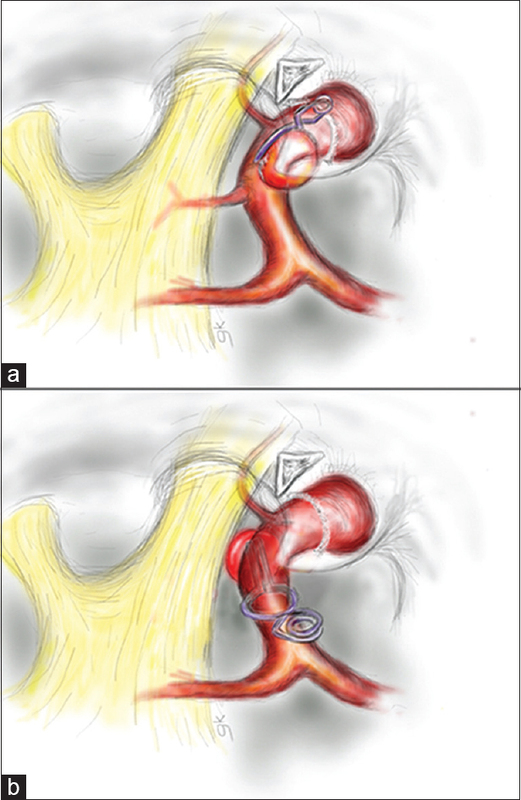 ICA-ophthalmic aneurysms are usually clipped with a simple side-angled clip [Figure 4]a and b. Sometimes one may have to take the ophthalmic artery in the fenestration. In contrast, superior hypophyseal aneurysms require a right-angled fenestrated clip, taking the ICA within the fenestration. It is important to preserve the PCOM and anterior choroidal artery in this clipping. Superiorly projecting aneurysms are clipped with a straight clip, parallel to both PCAs. Similarly, anteriorly projecting aneurysms are clipped with a lateral clip trajectory, with a straight clip. With more posterior projecting aneurysms, one may require a fenestrated clip, taking ipsilateral PCA in the fenestration. Louw DF, Asfora WT, Sutherland GR. A brief history of aneurysm clips. Neurosurg Focus 2001;11:E4. Clip Finder - The Aneurysm-Clip-Identification-Tool [Internet]. Available from: http://clipfinder.klinikum.uni-muenchen.de/en/start.htm [Last cited on 2015 Feb 2]. Fox JL. Vascular clips for the microsurgical treatment of stroke. Stroke 1976;7:489-500. Sutherland GR, Kelly JJ, Boehm DW, Klassen JB. Ceramic aneurysm clips. Neurosurgery 2008;62:ONS400-5. YASARGIL_Aneurysm.pdf [Internet]. Available from: http://www.bbraun.com/documents/Nanosites/YASARGIL_Aneurysm.pdf [Last cited on 2015 Feb 2]. sugita2.pdf [Internet]. Available from: http://www.mizuhomedical.jp/sugita2.pdf [Last cited on 2015 Feb 2]. Celik O, Niemelä M, Romani R, Hernesniemi J. Inappropriate application of Yaºargil aneurysm clips: A new observation and technical remark. Neurosurgery 2010;66:84-7. Lawton MT. Seven aneurysms tenets and techniques for clipping [Internet]. New York: Thieme; 2011. Available from: http://search.ebscohost.com/login.aspx?direct=true&scope=site&db=nlebk&db=nlabk&AN=534236 [Last cited on 2015 Feb 2].